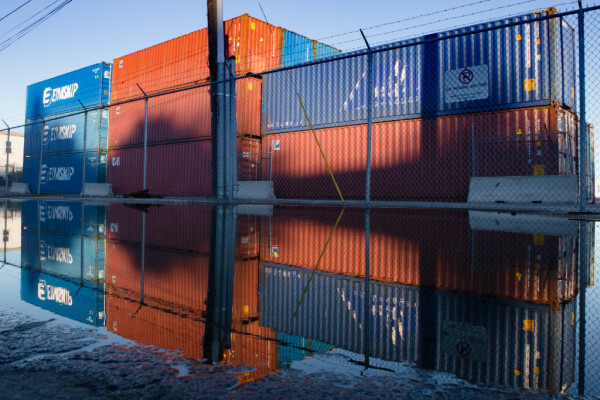 Shipping containers stand stacked at the Eimskip facility on Commercial Street in Portland on Wednesday. PORTLAND, Maine — For Maine, climate change’s silver lining may well turn out to be that the thawing of the Arctic Ocean boosts the state’s economy, according to public officials who gathered here this week. 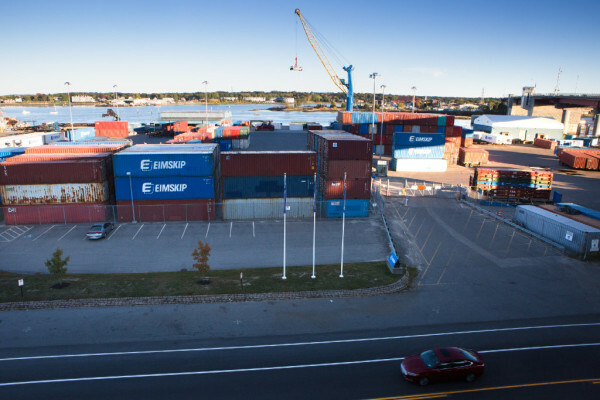 “I see opportunities,” said Dana Eidsness, director of Maine North Atlantic Development Office, which is part of the Maine International Trade Center. Alaska is positioned to be a more dominant player in Arctic issues because much of it lies north of the Arctic Circle. But Maine is the state closest to the Arctic nations of Iceland, Greenland and Scandinavia. With all this in mind, more than 100 people, including many from Maine’s business community, met Monday at University of Southern Maine in Portland to discuss the thawing of the Arctic Ocean. Attorneys with maritime law practices and representatives from University of Maine School of Law, insurance companies, shipping company Eimskip and other private businesses mixed with an array of federal and state officials as well as with academics. Eidsness’ office helped to organize the forum, which was held in conjunction with a meeting of the Arctic Council at the Westin Harborview hotel in Portland. The council, formed in 1996, consists of eight nations — Canada, Denmark, Finland, Iceland, Norway, Russia, Sweden and the United States — plus members of indigenous populations who are working together to promote cooperation, sustainable development and environmental protection in the Arctic. Other nations have been given observer status at the council’s meetings, which are not open to the public. The idea of making money off the melting Arctic has drawn protests from critics who say Maine should be trying to prevent rather than profit from climate change. State and business officials say that while it is important to try to put the brakes on global warming, Maine should be involved in trying to make the best of changes that are inevitable — both for the 4 million people who live above the Arctic Circle and those who seek to use the shorter shipping route between the Atlantic and Pacific oceans that is opening up through the north polar seas. U.S. Sen. Angus King said at Monday’s forum that it is “imperative” to reduce the global use of fossil fuels in order to slow the rate of climate change and “make it not quite as bad.” But, he added, climate change has begun and people worldwide will have to adapt. Part of that adaptation, King said, is looking reality in the eye and preparing for the future, both from the environmental and economic standpoints. Russia’s aggressive development of infrastructure along its long northern shoreline and its assertiveness on the Arctic Ocean are also reasons the United States should to pursue an active role in the region, King said. The thawing of the Arctic was in the news in Maine last summer when the Crystal Serenity cruise ship docked in Bar Harbor just after having become the first large passenger ship ever to cross Canada’s Northwest Passage. Eidsness said Monday that her office was created in 2013 in the wake of Iceland-based shipping firm Eimskip relocating its North American headquarters from Virginia to Portland. She and other officials in Maine have credited Eimskip’s move with helping to turn the attention of Maine officials toward the Arctic. Part of her responsibilities, Eidsness added, is to make sure Maine is taken into consideration in international conversations about the Arctic’s future. “It’s important to be in those discussions, both from a climate change perspective but also from a trade and logistics perspective,” she said. And it’s not just Eimskip that feasibly could get added business as a result of increased shipping activity in the Arctic, according to Eidsness. For example, Harbor Technologies, based in Augusta, is using composite materials developed in Maine to design waterfront facilities that can withstand the pressures of shifting sea ice, she said. Research entities such as the Climate Change Institute at University of Maine and Bigelow Laboratories for Ocean Science in Boothbay also stand to attract funding as climate research continues in the Arctic region, she said. Maine Maritime Academy in Castine has a partnership with University of Alaska at Anchorage to develop an ice navigation curriculum and ice search and rescue protocols for the U.S. Coast Guard. King and other officials at Monday’s forum said the United States has only a handful of icebreaking ships and, though the projected cost of a new icebreaker is about $1 billion, building more would help America maintain its leadership role in the region. Bath Iron Works, the shipbuilding defense contractor that recently lost out on an $11 billion contract to build nine offshore patrol cutters for the Coast Guard, was not mentioned during any of the informational sessions at the forum. King and others have said previously, however, that the shipyard could be a contender if Uncle Sam wants more icebreakers.